Albemarle stock has been knocked down in parallel and in proportion with the decline in lithium prices in the past few years, even though only a third of revenue is lithium. Given its financial results, the company seems oversold at the moment, mostly due to lithium sentiment. Lithium market may surprise to the upside in coming years, but the shorter-term outlook is uncertain, which is why Albemarle continues to be an ideal candidate for a lithium investment choice. 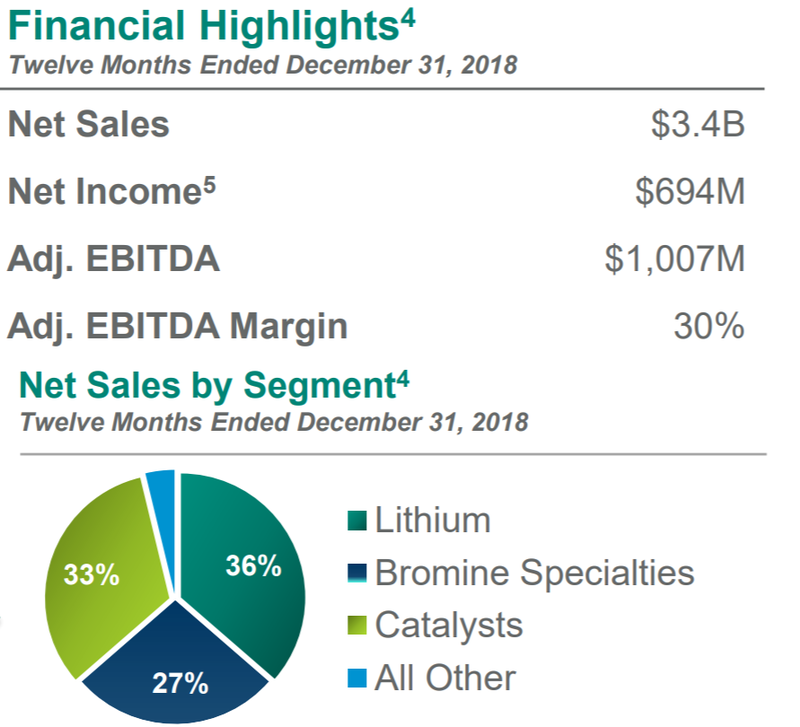 I bought Albemarle (ALB) stock right before a number of negative studies came out in regards to the outlook of the global lithium supply/demand situation. 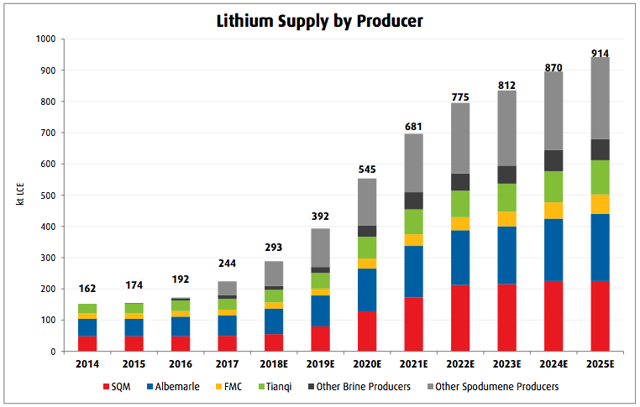 While lithium demand is set to increase substantially, there are also worries of oversupply as miners are ramping up production in order to meet demand. In other words, we are looking at supply overshoot in the next few years, even as demand continues to surge. Needless to say that Albemarle stock took a tumble since then, even though lithium still makes up only a third of its overall revenue. Not only does Albemarle have other profitable sectors of its business to rely on in the event that the lithium situation gets even worse, but it also continues to be profitable in its lithium business as well. Looking at these considerations, this is clearly the case of an oversold company. The only thing that is now missing is a lithium market turnaround, that is needed to change sentiment, which should happen soon in my view. In the meantime, there is very little downside to this company, so there is no risk in waiting, which is why I remain invested. The timing of an eventual turnaround as well as the shape it will take, in other words, the price balance that will eventually be reached in order to satisfy suppliers, as well as consumers, are all unknowns at this point in time. No one knows for sure just how much demand growth we are looking at. Albemarle has its own estimate in this regard. 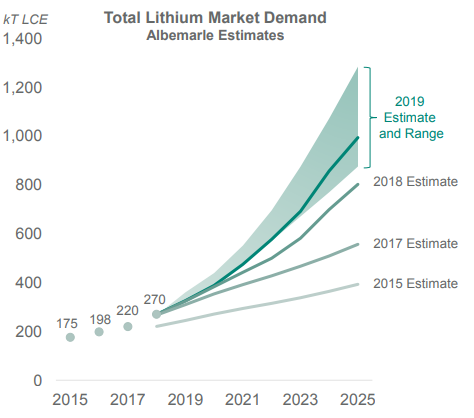 In the most optimistic scenario envisioned by Albemarle, lithium demand will more than quadruple compared with 2018 levels. This, by itself, would suggest the future is bright for lithium miners. But then, there is the supply scenario to consider. While this supply scenario would suggest that even at the lower end of Albemarle's 2025 estimate, the market should basically be in balance, we should keep in mind that Albemarle's demand outlook may contain some degree of wishful thinking. My own take is that the demand outlook is very uncertain at this point. There are more and more signs that automakers are ready to ramp up EV production and sales, but at the same time, we are getting more and more evidence suggesting that automakers are set to take deep losses on each and every mass-market EV they are set to sell. In other words, the purely profit-driven interest for automakers will be to sell a limited number of such vehicles. At the same time, they all want to establish themselves in this fast-growing niche market, in case that EV technology does indeed become increasingly dominant. In regards to consumers, I foresee a turn away from subsidies as EV sales volumes continue to increase because governments will increasingly find the cost to be a heavy burden as sales continue to grow. And yet, just now we are learning that a bipartisan bill which was just introduced meant to increase the cap on US Federal subsidies for EVs by 400K from the current 200K. It remains to be seen whether it will pass given that there are already growing worries about US budget deficits going forward. If subsidies will gradually disappear, consumers will have to pick up the slack. The net effect could be a widening gap between the amount of money that consumers would be willing to pay for an EV and the break-even costs of car manufacturers to provide the EVs on the market. On the other hand, I do foresee much higher average oil prices in the near future, which might make EVs more attractive to consumers. The reason I believe this will happen is because we are getting close to the end of the prime acreage drilling in the shale industry. While I don't believe this will be the end of shale drilling and production, I do think, based on years of close observation of the industry, that once the industry be relegated to mostly second tier acreage, we will see average oil prices in the $80/barrel range in order to keep the industry going. Currently, it seems that $60/barrel is the magic threshold for companies mostly drilling what is left of their prime acreage. I recently wrote an article entitled "Beginning Of The End Of The Shale Boom", which explains this issue in more detail. The future of the oil industry plays a major role in my own big-picture view of the future of EVs, therefore, the future of lithium. My overall view at this point is that there is a great deal of uncertainty in the shorter term, but looking beyond the middle of next decade, I simply do not see how the world's economy will cope without a robust EV industry to cap oil demand growth because I am not entirely convinced oil supply growth will continue beyond that. Albemarle continues to be ideal candidate for long-term lithium exposure. 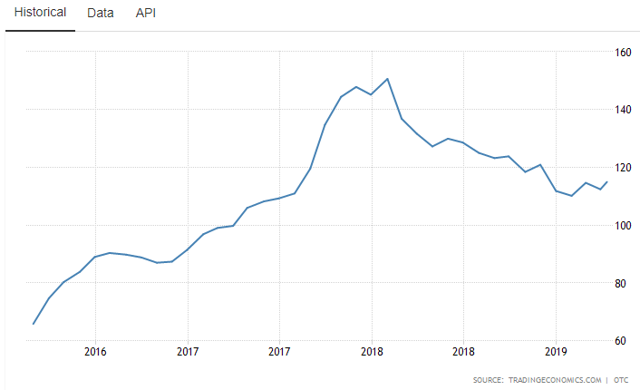 The lithium market has had a rough time as of late, precisely because we have a deeply entrenched view that we are looking at a supply glut in the next few years. Albemarle's stock price more or less follows the same path that lithium prices did, even though it is not a pure lithium play, as I already pointed out. Its revenues and profits growth trend was not derailed by the lower lithium prices either. Net profits increased from $494 million in 2017 to $594 million in 2018, according to its latest quarterly report. Revenues increased from $3.07 billion in 2017 to $3.37 billion in 2018. It is not a dramatic increase by any means, but it is growth, nevertheless. It is understandable that the stock price peak we saw in late 2017 was a reflection of expectations of more phenomenal growth, but I do think that the 40% decline in its stock price that we have currently from that peak is overdone. This company is still experiencing significant revenue and profits growth, and it is currently trading at a P/E ratio of 13.60, which is well below the market average. I should note that the market average will most likely see less stellar growth in revenues and profits than this company is set to experience going forward. As the lithium price chart above shows, there may be a turn towards the positive in terms of lithium prices. It is still too early to tell whether this is the actual turn in the market. 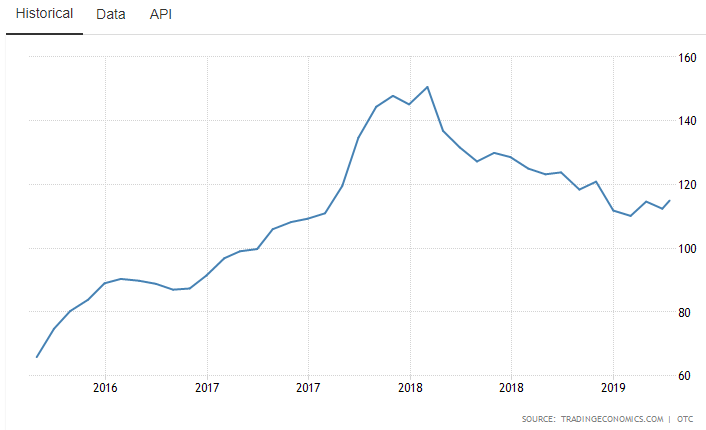 My guess is that there may be still some downward surprises, but I think any further downturns will be limited by the need to keep prices high enough to maintain production growth. We need to keep in mind that holding production steady simply will not do in terms of global lithium supply needs. Therefore, prices will have to remain high enough to encourage continued mining investment growth. Any lithium price gains from current levels should provide for continued recovery for this stock, as it will help further improve revenues as well as profitability. Because the shorter term outlook for lithium continues to be somewhat uncertain, Albemarle continues to be ideal candidate to be invested in if one wants to maintain investment exposure to lithium because it is not a pure lithium producer. It is also proving that it is able to continue to grow revenues and profits, despite hard times within the lithium space. The way I see it, one has to maintain longer term exposure to the EV and electricity storage development trends, given the changes taking place. As far as EVs go, I never liked the Tesla (NASDAQ:TSLA) story much, while the rest of the EV producers are mostly ICE-powered car producers, with EVs only making up a loss-making niche segment. For this reason, I think the indirect approach of investing into lithium miners is the better option. For that reason, I intend to continue holding onto this investment and may even consider adding perhaps this year or early next year in order to take advantage of the selloff. It may take a few more years, but I do believe this investment will pay off. Disclosure: I am/we are long ALB. I wrote this article myself, and it expresses my own opinions. I am not receiving compensation for it (other than from Seeking Alpha). I have no business relationship with any company whose stock is mentioned in this article.